Our content series on lifecycle email marketing provided an overall summary of the process, has discussed reward emails, segmenting and engagement. Today I am bringing examples into the conversation, so we can take a look at a few email marketing cycles that are beneficial to the consumer, and favorably used by the marketer. This triangle of ideas is what email marketers need to be focusing on with their efforts, and as you will see through the examples below, some companies execute on lifecycle campaigns well. These examples all come from personal emails I’ve received from companies during the last few months. I have willingly opted into email messages from these companies, and they’ve nurtured the relationship on their end by providing the right messages at the right time. The first example comes from Guitar Center. At the time of receiving this email, I had just made a purchase from one of their retail stores. I believe this promotion wasn’t only catered to recent buyers, but the timeliness and offer still make it relevant. 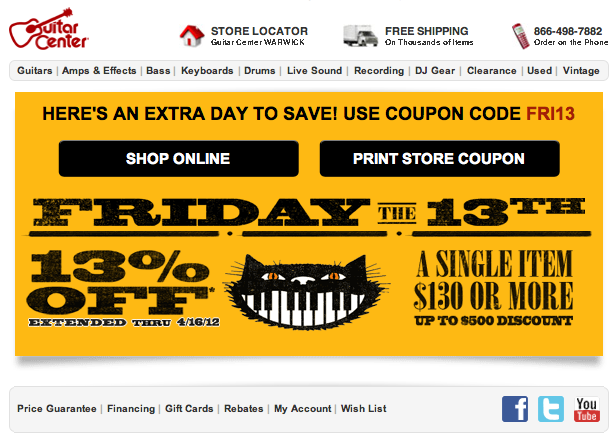 Not only does it play off the “holiday” of Friday the 13th, it provides a sizable discount on a purchase. For someone like myself, who had recently purchased from the store, my level of engagement was already high. A discounted offer can lead to another purchase, especially if the buyer saw something else in the store, or online, of interest. It’s also worth noting that the promotion was straight-forward, and contained social engagement options like Facebook and Twitter. Very eager fans could share news of the sale with their friends. 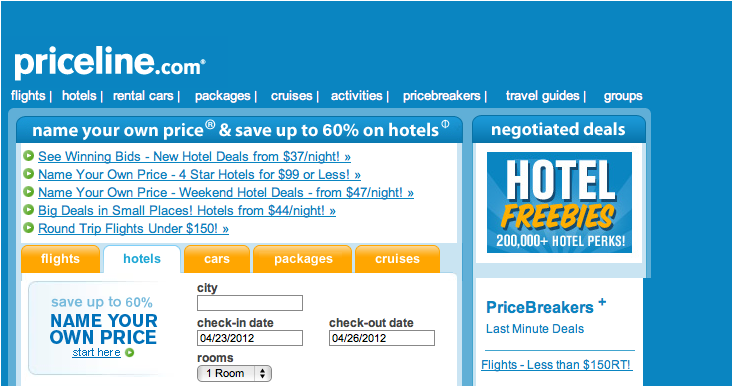 The next promotion came from Priceline. After last week’s Mequoda Summit, I decided to stay in Colorado for a few days. I booked my hotel accommodations through Priceline. The day my hotel reservations ended, I received an email from Priceline, informing me of extremely low hotel rates for many locations throughout the country. At this point, my engagement level was high, after just using the service and having a positive experience. Being presented with hotels at a rate of $37 per night, my interest level for another short vacation grew. 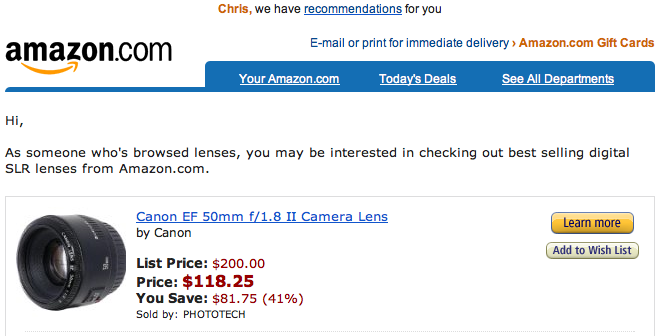 This last example comes after conducting a search on Amazon for a camera lens. This email is great for consumers who are actively looking to make a purchase. Amazon provides the best-priced items to engage the consumer and persuade them into the action. However, some potential buyers may be unhappy with this type of email since it involves tracking their search habits. For those who want the extra input, this suggestion-filled email may lead to a direct purchase. Do you have any examples to offer on companies who have put you into an lifecycle email campaign? Please add your experiences to the comments below. Tagged with ad, Amazon, content, email, email campaign, email marketing, email marketing service, Facebook, mequoda, text ad, twitter.